Dining in Magic Kingdom’s Cinderella Castle is truly an experience every Disney fan should have. Once you enter into the castle’s waiting chamber, you get to meet the beautiful Cinderella and children are given magic wands or sabers! From here, you walk up the winding stone staircase to the dining which, which is hung with plush tapestries, outfitted in red and purple velvet, and sparkling with light coming through stained-glass castle windows. Yep, you’re really here! Food is adequate here, but that’s not really what you’re paying for anyway. You’re paying to eat INSIDE the castle and meet the Fairy Godmother, Suzy and Perla, and perhaps a princess or two. You’re paying to stare at the vaulted, stone ceilings and the banner flags from the kingdom. It truly is a royal experience. 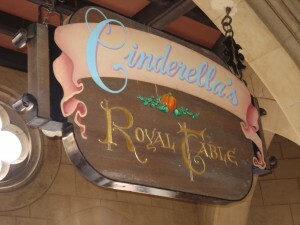 Reservations are very difficult to get for Cinderella’s Royal Table, especially for breakfast. Call 180 days in advance for reservations. If staying at a Disney resort, call 180 days in advance and ask for availability during all days of your stay. A credit card number is required at time of booking. If you need to cancel, do so prior to 24 hours before your reservation time; there will be a fee to cancel within 24 hours. Characters (Princesses and others) appear at breakfast, lunch, and dinner here. Proposal packages are available. To help you plan the perfect proposal, CRT has its own “Fairy Godmother” to assist you. Magical Proposal Packages provide an all-inclusive dinner at Cinderella’s Royal Table featuring a specially created Chocolate Slipper Dessert, an engraved Glass Slipper in which the ring is presented, champagne flutes and more. Call (407) 824-4477 or email wdw.crt.special.events@disney.com for pricing, details and proposal arrangements. Requires at least 7 days notice. Breakfast, lunch and dinner allow a la carte choices from a menu. Famous Dishes: Stuffed French Toast, Beef Tenderloin, Major Domo’s Short Ribs, The Clock Strikes Twelve dessert.